NOTICE: Payment Visa Fees and Consular Service via Standard Chartered. 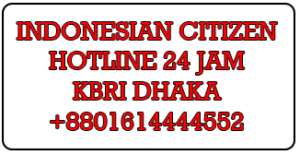 The Embassy of the Republic Indonesia would like to inform for each of visa fees will have additional cost for Bank Administration amount of Tk 345 (including VAT) and for the Consular Services (Indonesian Citizen Documents) no additional cost. The Embassy’s apologize for any inconvenience, for your kind attention and cooperation thank you very much.